Far left crank Dana Milbank vowed today to make February a Palin-free month. I have written about her in 42 columns since Sen. John McCain picked her as his presidential running mate in 2008. I’ve mentioned her in dozens more blog posts, Web chats, and TV and radio appearances. I feel powerless to control my obsession, even though it cheapens and demeans me. But today is the first day of the rest of my life. And so, I hereby pledge that, beginning on Feb 1, 2011, I will not mention Sarah Palin – in print, online or on television – for one month. Furthermore, I call on others in the news media to join me in this pledge of a Palin-free February. With enough support, I believe we may even be able to extend the moratorium beyond one month, but we are up against a powerful compulsion, and we must take this struggle day by day. Yeah. Good luck with that loon. You know you’re addicted. I give you about 2 weeks. Included in his hit piece on Sarah Palin is an anti-Palin poll asking readers to join him in his boycott. Have you ever seen such a thing? So now after accusing her of mass murder last week, the state-run media is so disgusted that Sarah Palin won’t go away that their going to just boycott her from their articles. And, they really wonder why no one trusts them anymore? 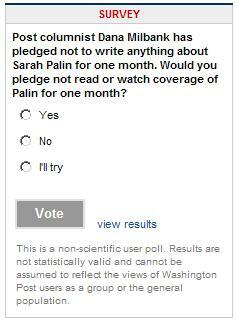 UPDATE: The WaPo decided to pull the anti-Palin poll from their article later this morning. I posted a cached copy of their poll that they deleted.